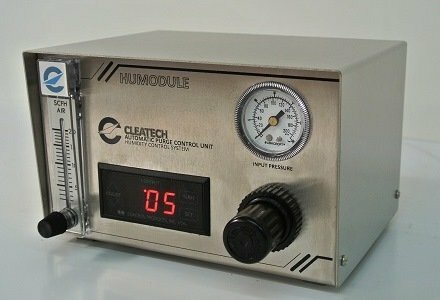 Automatic Purge Control Unit with RH sensor- Humodule H a dehumidification system ,capable of measuring and displaying humidity in the range: 0-100%RH, Accurately controls and maintains the RH% on a set point between 5%RH to ambient level (+/- 3% RH) , required compressed dry air or inert gas. For more critical requirements, select the Multi- Channel nitrogen purge control unit. (Available in two to four channel models). For each chamber there is separated sensor and controller. When any door opens the system responses faster to the sudden RH% increase.